My student Sara Rivenbark writing about Brittany Waters’ BFA Ceramics thesis exhibition #MoreThanASandbox, in the School of Art’s Dutzi Gallery on 5 April 2017. Brittany is a senior soon to graduate with her BFA in Ceramics. She is originally from northern California where she went to Sierra College and got her AA in studio art. She has tried her share of painting and sculpture classes, but realized that her passion really lies in being able to shape clay with her hands and being able to put as much detail as possible in her work. Her inspiration comes from nature and has changed as she moved from the forests up north to the beach and the ocean down south. 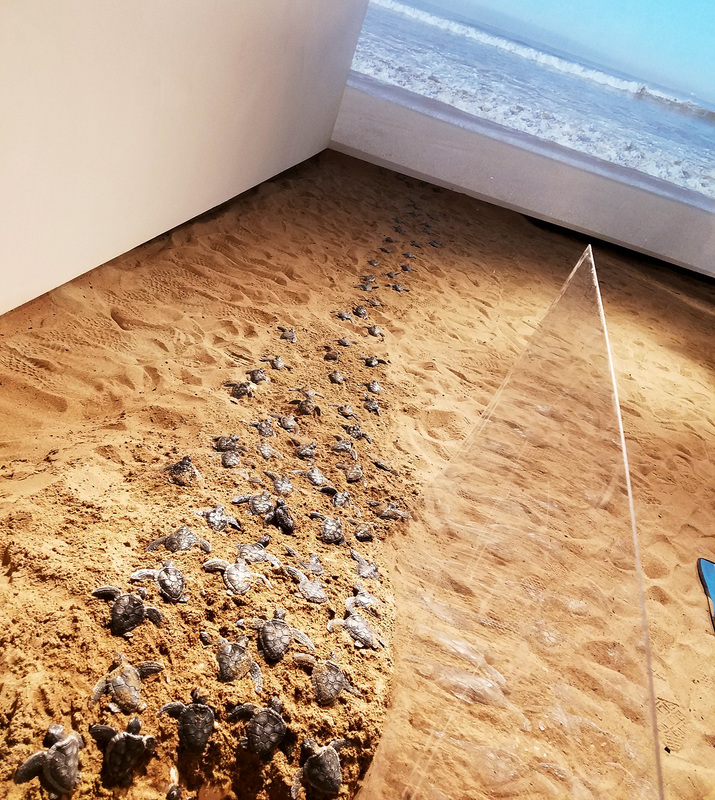 This installation is a beach scene with the human interaction of a beach chair combined with the natural events of a sea turtle hatching. Real sand was brought in and combined with a video of the ocean along with the sounds of waves breaking on the sand. Palm fronds were added and then the turtle nest with all of the little turtles making it toward the ocean. The scene was very realistic and detailed. Many people thought the ceramic turtles were real because the detail on them was very life-like. Brittany wanted to show how the beach is not only a place that people go to hang out and play on, but is a place where life starts. She wants to bring to light that sea turtles have it rough, most of the eggs that hatch don’t make it to adulthood, and that we need to not only share the beach with them, but also allow them the space they need in order to make it at least a little bit easier for them. I’m a biology major and I’m thinking about getting into conservation so I really appreciate and admire Brittany for using her art to both create something beautiful and to spread the word about endangered sea turtles. I’ve always loved the beach so it was cool to walk around the corner of the wall and see the beach right in front of me and with all the adorable little turtles in the sand. The detail that Brittany put into the turtles is impressive and I almost wanted to ask if I could have one.